Often in business we are at the mercy of the workload, whether that be direct from customer or via project milestones. Human nature dictates that we tend to work faster towards the finishing point, or when busy which would indicate a preference for some stress in the working day. If we examine two aspects of shift, the productivity affected by day of the week and the risk association with shift work then we can get a picture of what the optimum looks like. 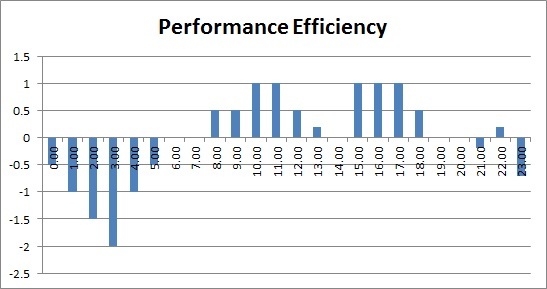 The performance efficiency can be measured across the day, showing the relative impact on performance at differing times of the 24 hour day. As you would expect performance drops during early hours of the morning from 11pm till the traditional morning start time of 8am. There is also a post lunch dip in productivity, this is the reason most business would stagger their lunch to offset the performance dip. It may also be an area that could be looked to improve, for instance some larger organisations have began to look into the idea of split breaks. A morning 30 minute break and afternoon 30 minute break not only helps to stagger the time away, but it can also provide you with less loss of productivity as staff returning from shorter breaks are able to get back to pace quicker. Of course the counter argument to that is, having two breaks double the disruption in the office, as employees discuss where to go, speak to colleagues or return and update colleagues as to where they have been. The working week has changed from the ordinary Monday through Friday, with a large number of businesses now operating across 6 or even 7 days per week. This has meant that productivity levels have changed and the natural curve of productivity has changed. Reacting to changes in your workload is key, but there are ways to also improve the distribution of workload, incentives on quiet days to customers or changing key deliverable dates to Thursday or Wednesday may improve this. 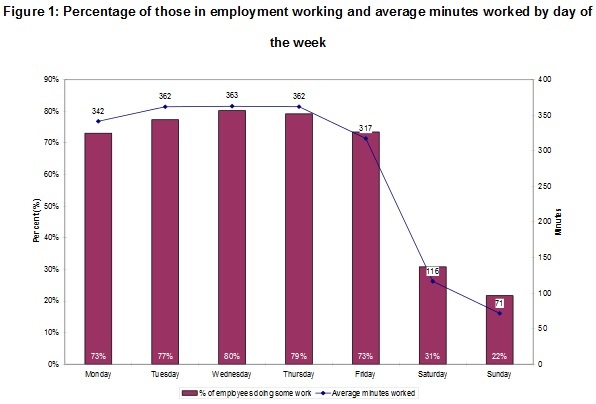 Absence continues to be highest on a Monday and Friday, providing employees with a longer weekend, although this has shifted slightly since the change away from the traditional working week. Although productivity is the key factor to business, we must also look at the risk association. A typical night shift would carry 20% more health and safety risk than the equivalent daytime shift, this may seem like a reasonable risk if the workload completed in the night is giving you a greater return, but it may mean you require to add additional safety checks into any night time processes. A health and safety accident can bankrupt a business so should not be ignored. - Have increased Part time workers to ensure shifts can be shortened and staff present at peak times. It is often the case that part time working is seen as bad, the productivity levels and expertise is such that part time working is inefficient. 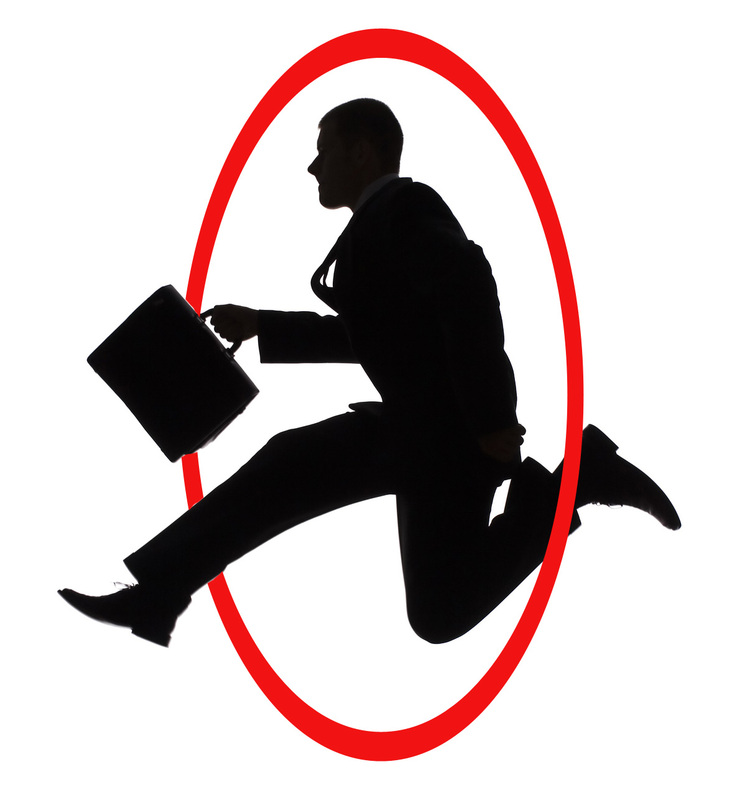 By the time an employee does the review process, learning, meetings and huddles, catching up with communications and the natural idle time (around 10 minutes per hour) it is seen their window of opportunity to be productive is so short it makes it ineconomical to employ them. Part time working needs to be assessed on the relative strengths of the employee, the complexity of the role and also the workload demand. 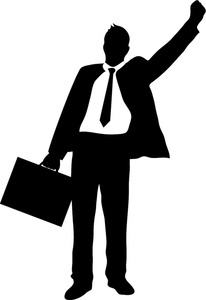 if the workload demand increases in short periods (for instance two hour peak during the day) the part timers can be used effectively to mitigate this, full time working in a traditional 9 to 5 operation will not provide you with the flexibility you require, on the other hand an 8 to 6 six day week operation allows you to flex your full time working patterns to accomodate workload fluctuations. Part time workers tend to have a greater desire to remain at the current level, often this can mean you have a constant well trained bedrock of staff that have a good length of service, something to be considered should you suffer a high turnover in employees.